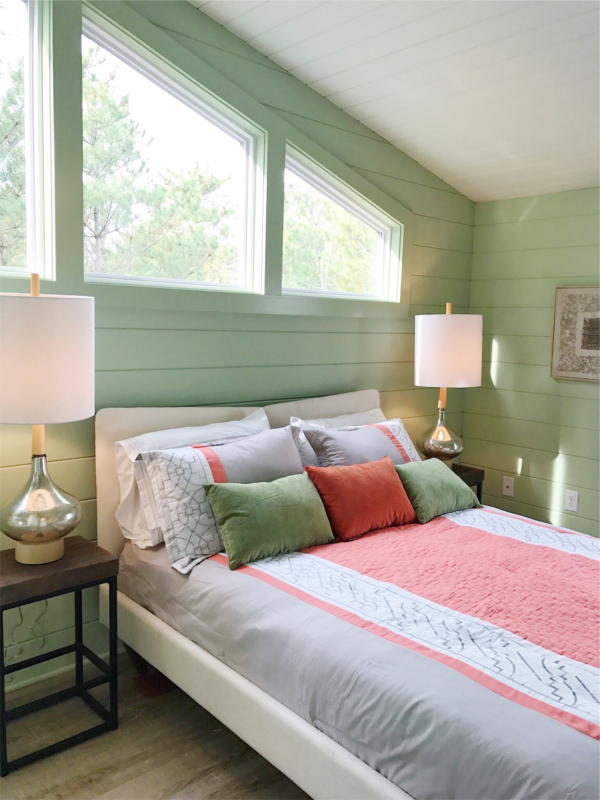 Nowadays, when people think of the beach, they often think of purchasing a lot with a small, outdated home, knocking it down, and starting from scratch. 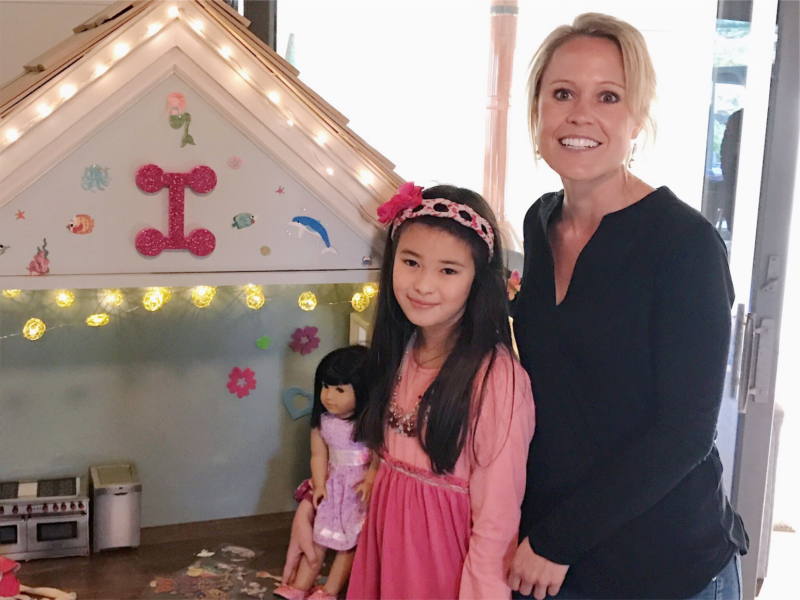 And while I love the idea of a custom home that perfectly suits your families needs and tastes (that’s what my business is all about, after all! 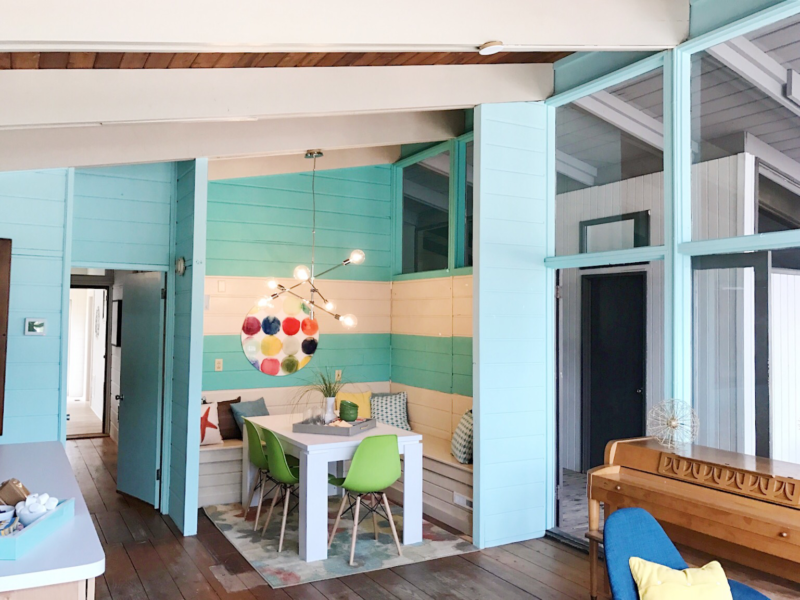 ), there’s something special about the charm and character of the original, quaint homes that line our shores – especially when they’re as unique as the midcentury modern beach house my clients Reg and Rachel found. 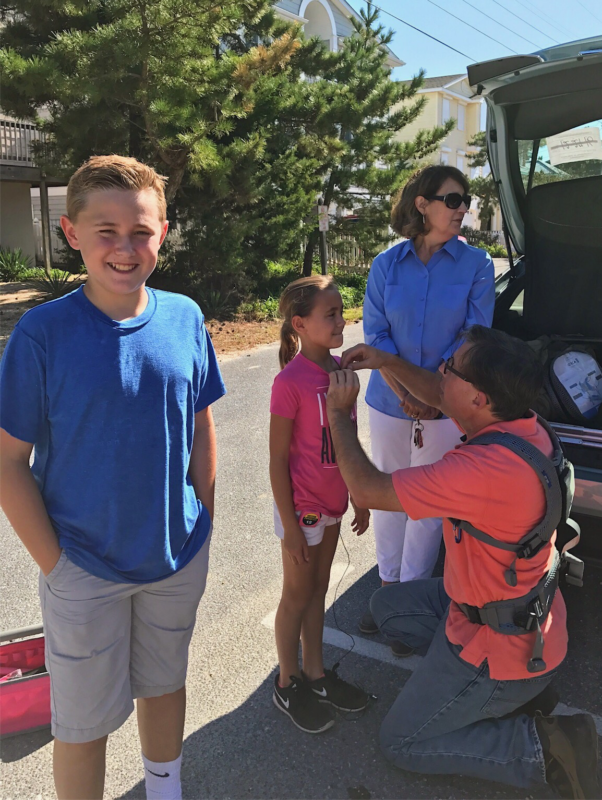 Reg’s job requires quite a bit of traveling, so when he does have time with his family, he wants to spend it somewhere special – somewhere like Bethany Beach. But Reg and his wife, Rachel, didn’t want just any beach house. They wanted a place with a unique style and a sense history, a place that spoke to their quiet coastal retreat dreams. And that’s precisely what they found. 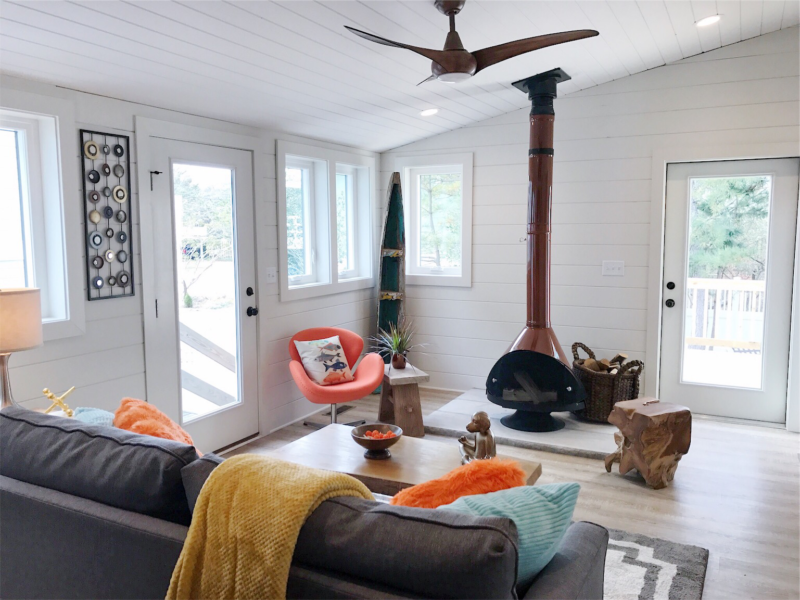 Their unique beach cottage, just one house away from the beach, is unlike any home the couple had seen before (and most of the homes in this area). This midcentury modern home has its very own breezeway running through the center of it – the definition of indoor/outdoor living and the couple’s favorite feature of the home. The houses around theirs have all been updated and changed over the years, but Reg and Rachel’s house remains one of the last standing original homes on the block. 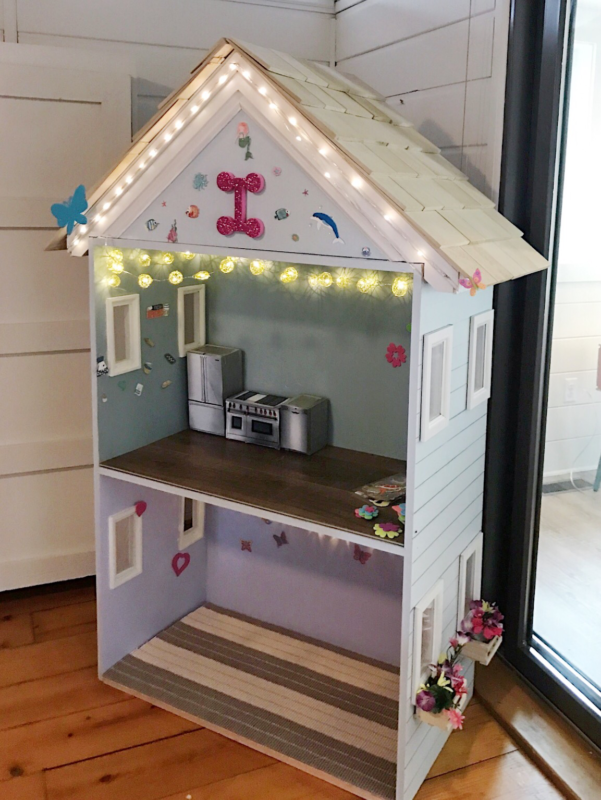 While many people would have knocked it down and built a modern construction, Reg and Rachel had promised the previous owner they wouldn’t do that – and they didn’t want to, anyway. 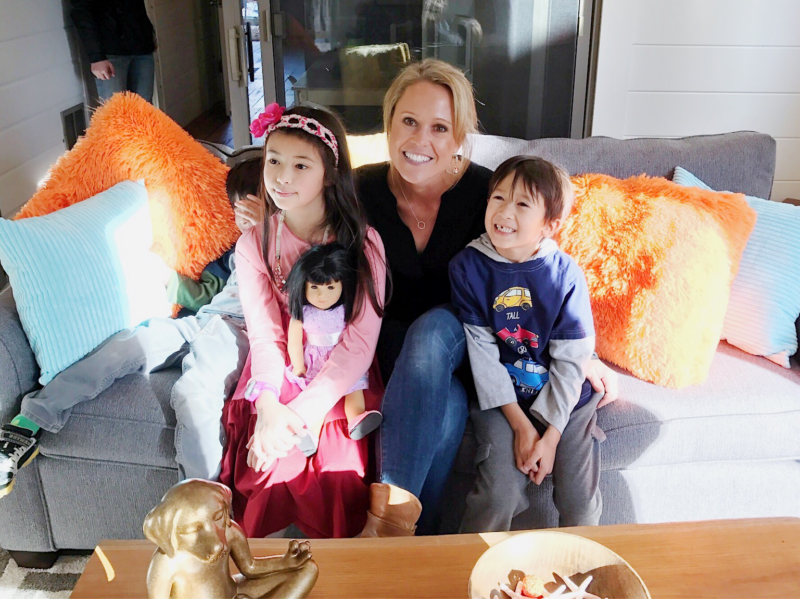 They loved the idea of restoring this house to its former midcentury glory and keeping its history alive – and they put their money on me to do just that. PROBLEM: The original kitchen was small, outdated, and dark, and cut off from the rest of the living space. As the natural gathering space for any home, this one was falling short. The couple wanted to keep as much of the integrity and charm of the original home as possible, while still having a modern, functional kitchen. SOLUTION: The first step was relocating kitchen to the far wall of the main living area and opening it to create a larger space. (We turned the space where the kitchen used to be into an eating area, but more on that later.) 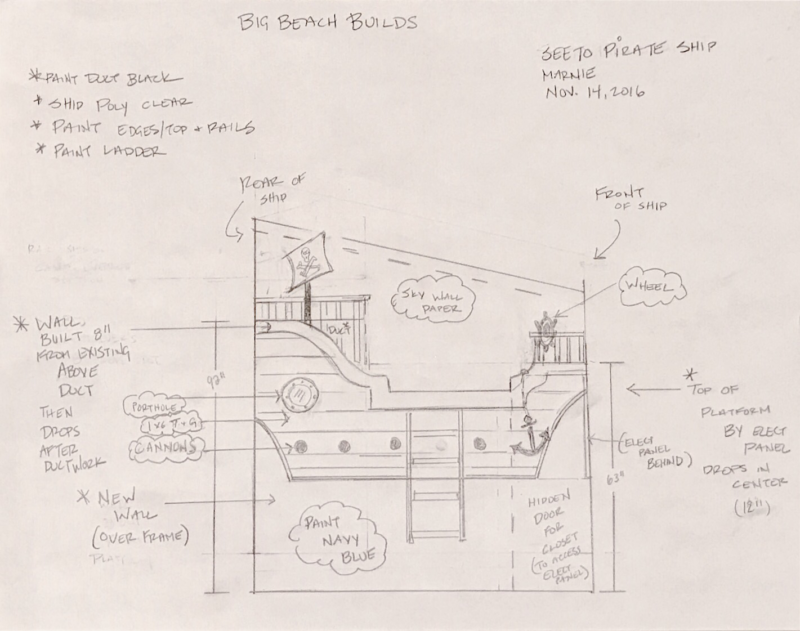 A new island delineates between the kitchen and the rest of the space. 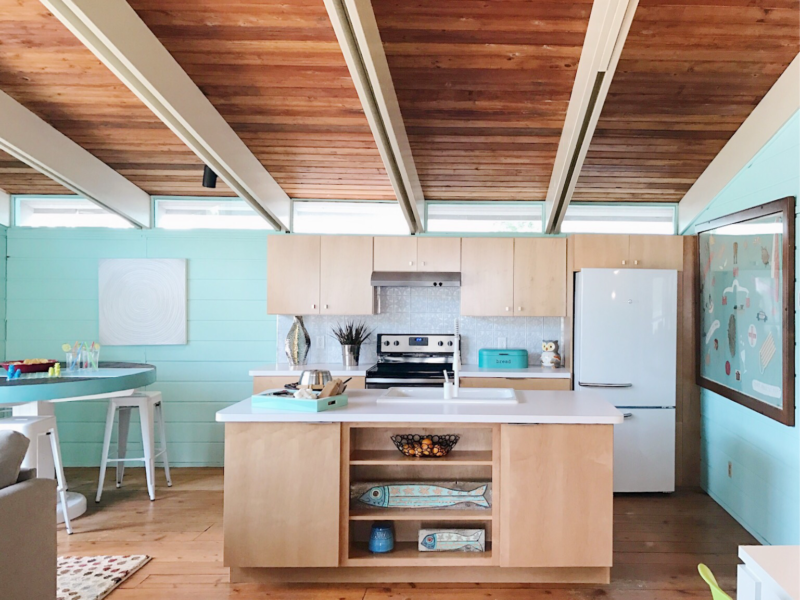 I also installed all new modern appliances and cabinetry that have a midcentury feel but with a classic beach look. PROBLEM: The breezeway was one of the most unique original elements of the home, and created a space meant for seamless indoor/outdoor living. 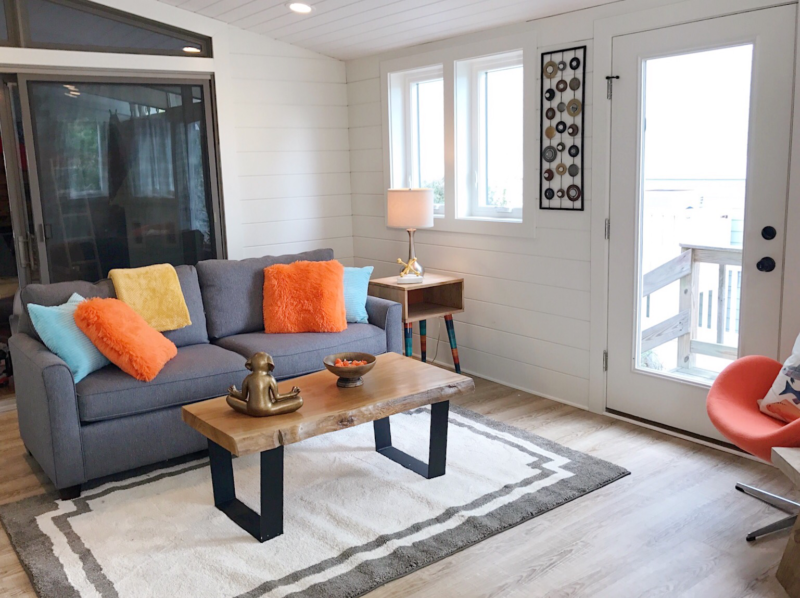 Reg and Rachel wanted to add more room to their home without losing this rare element, but it separated the common living space from the private bedrooms. It was also difficult to heat and cool the home since the two enclosed parts were separated by the screened-in breezeway. 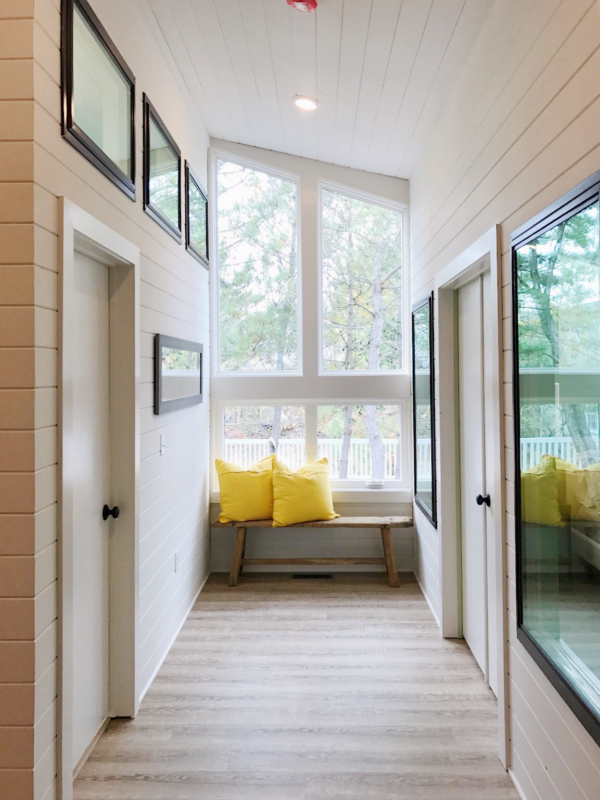 SOLUTION: We added a sun room onto the back of the house so that we could add more space for entertaining without losing the interior breezeway. 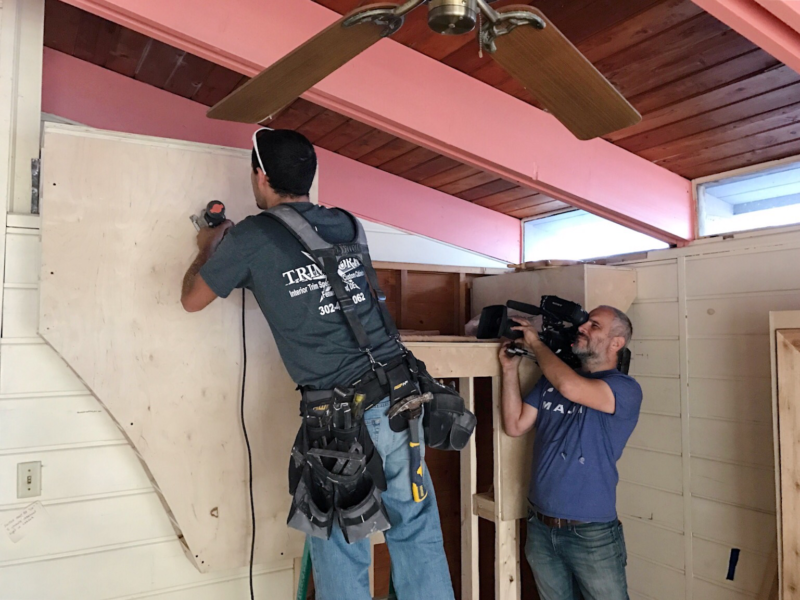 We then reworked the entire HVAC system to make sure all the interior rooms stay a comfortable temperature, no matter the season. Towards the back of the house, we added a small kitchenette/mudroom. 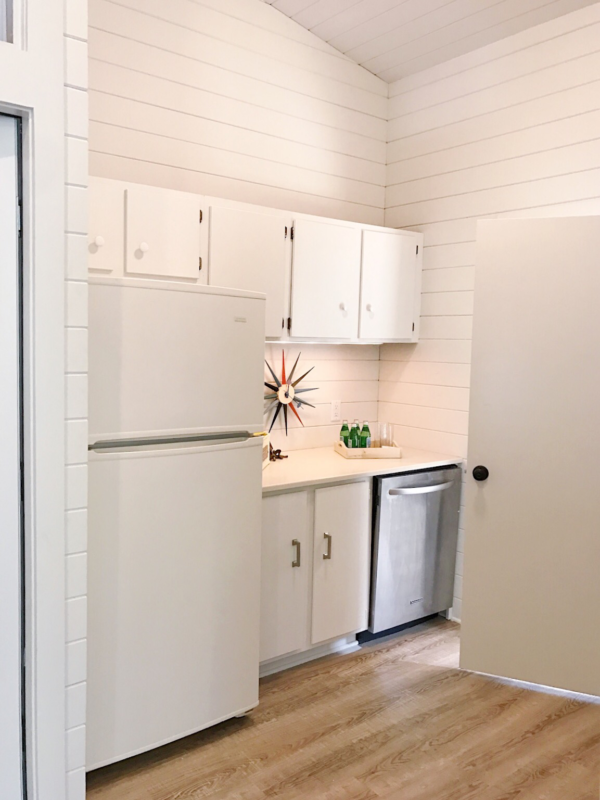 The kitchenette has a refrigerator, sink, and dishwasher, offering convenient indoor/outdoor living, and giving the Reg and Rachel another place from which they can serve guests when entertaining. 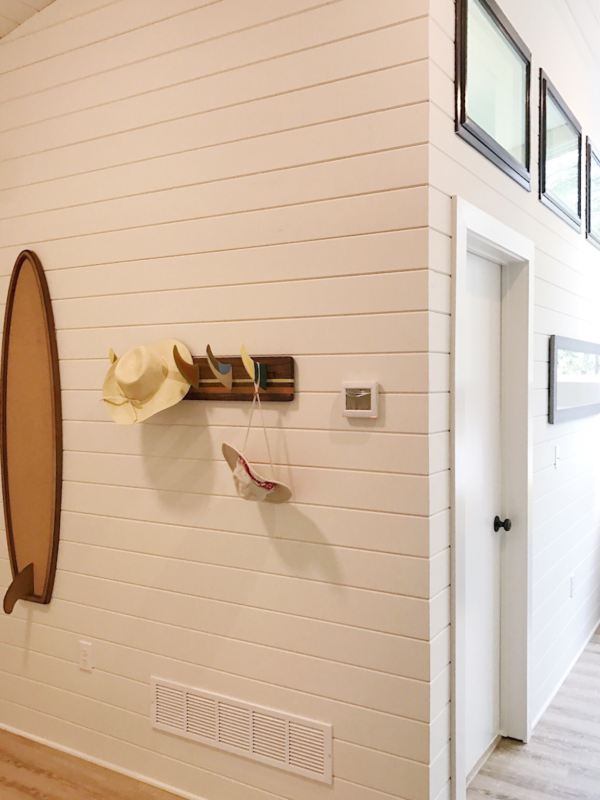 With not one, but two access points, the mud room is highly accessible and functional. I repurposed the old main kitchen cabinets in the kitchenette to retain a piece of the original home, save money, and be sustainable. 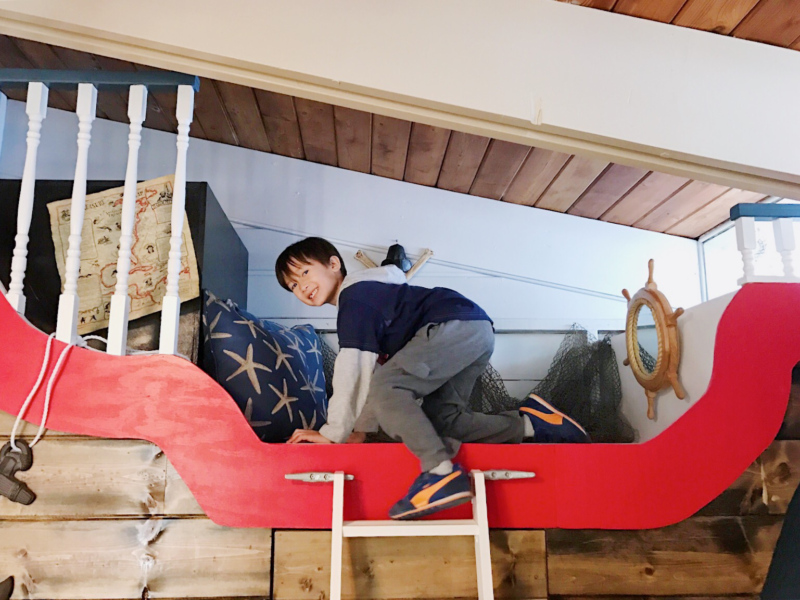 PROBLEM: There wasn’t much family living space in the home, making it difficult for the couple to spend time with their kids indoors. 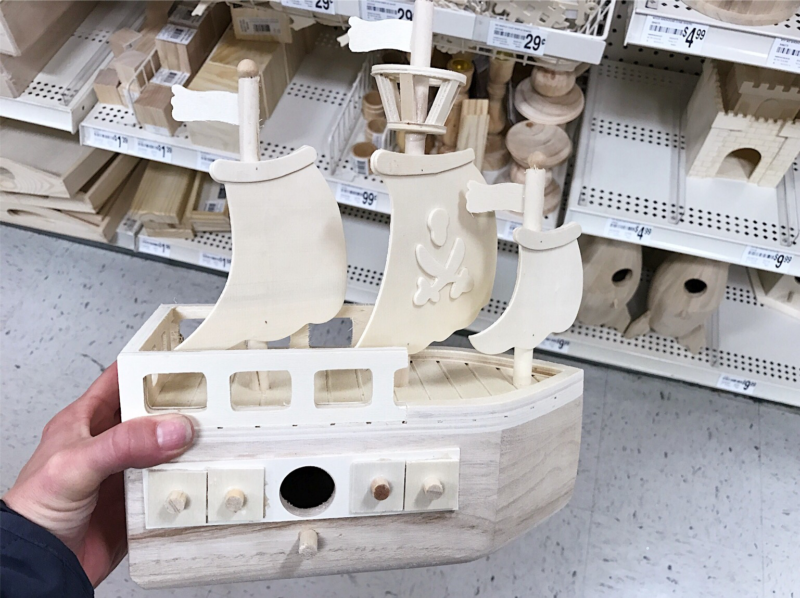 They also needed more space for guests to hang out inside. SOLUTION: By opening up all the walls in the main area of the home, we were able to create a large, airy entertaining space. We kept the roofline so we didn’t lose the midcentury vibe the couple loved, but scooted some things around within the space to make it flow better. 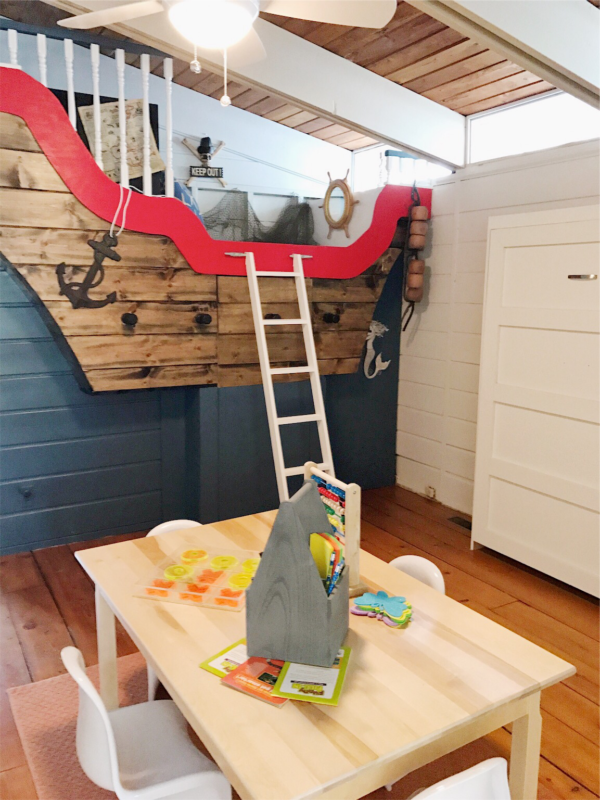 We used the benches that were once in the living room to create a built-in breakfast nook/eating area, and also repurposed the home’s siding on the walls in the nook. 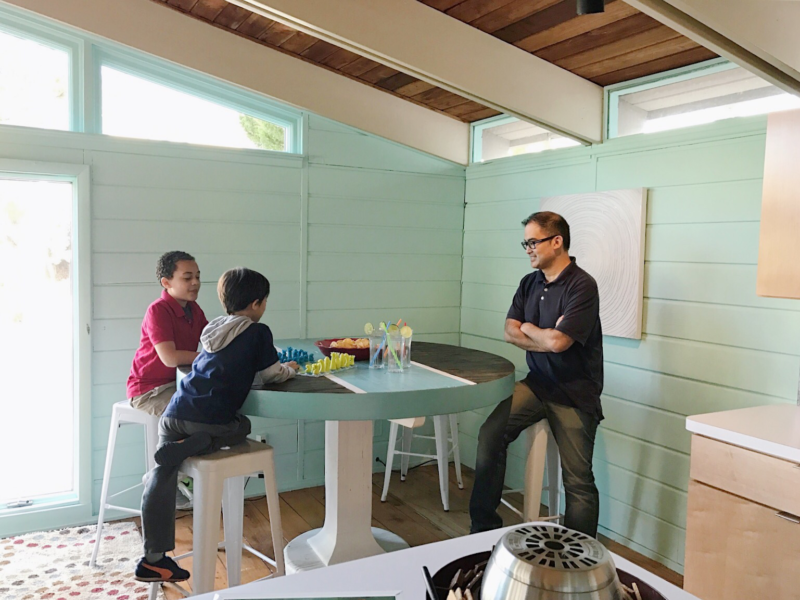 Between the living room and the kitchen, we added a round table made from the home’s former deck boards – the perfect place to play games with family. The new space is centered around the new kitchen, making this the true hub of the home. 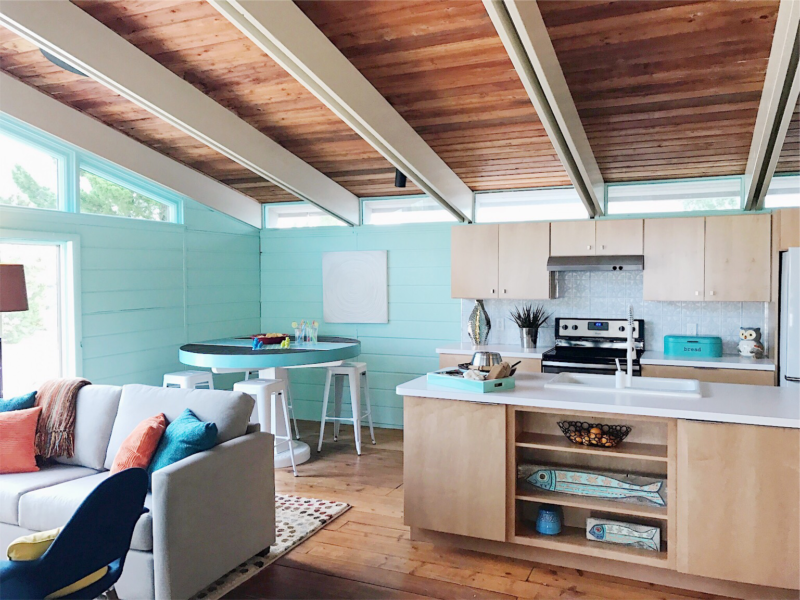 A few midcentury touches and just the right amount of coastal flair honor this home’s history as well as its future. PROBLEM: Reg and Rachel have three young children with lots of energy, but not a lot of space inside to use it. 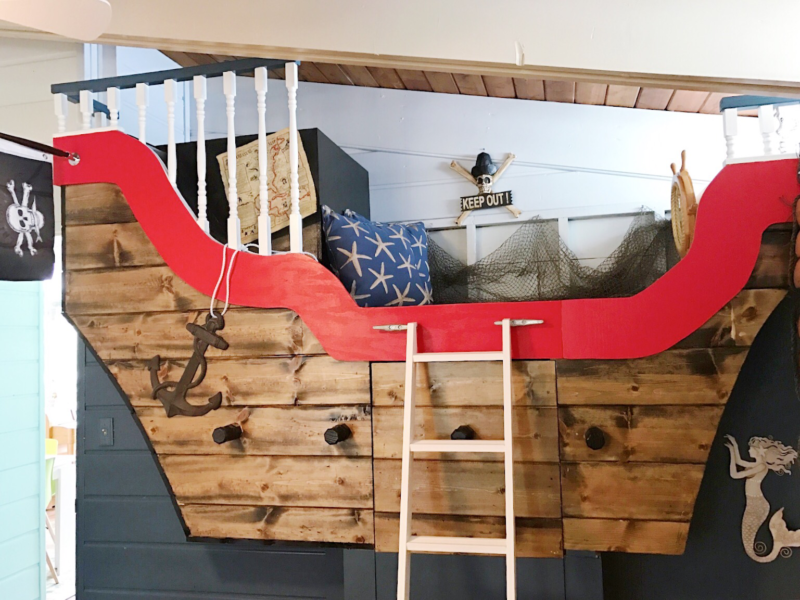 They craved a place for the kids to play on rainy days or when they’re entertaining adults, but also dreamed of a space that could be closed off when it wasn’t it use. Lastly, while they had enough bedrooms for their immediate family, they had no place for overnight guests to sleep. PROBLEM: The former master suite was off the living room and kitchen, lacking much-needed privacy from the rest of the home (and house guests). 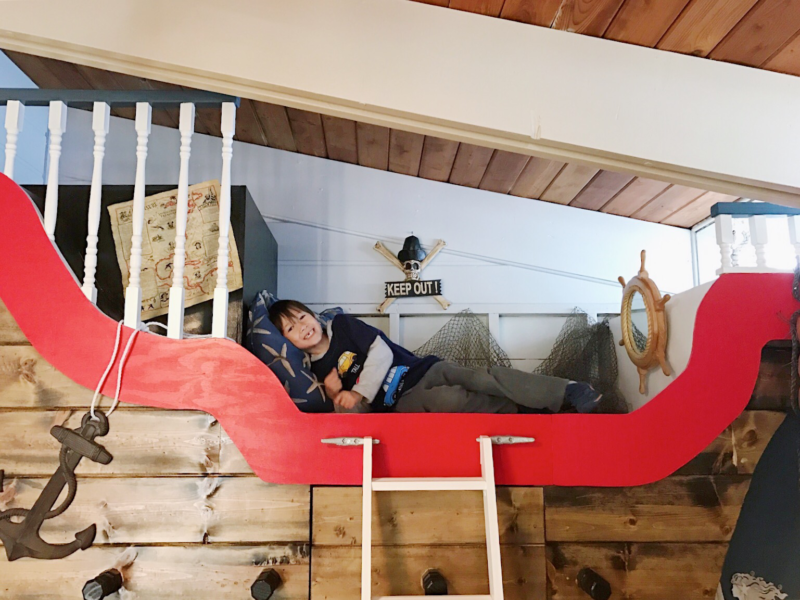 SOLUTION: Since the old master bedroom was now the playroom/guest room, and because the homeowners really wanted a private space, we decided to build the new master from scratch. We built an extension onto the back of the house to create a private master suite that isn’t as close to the entertaining spaces as it once was. 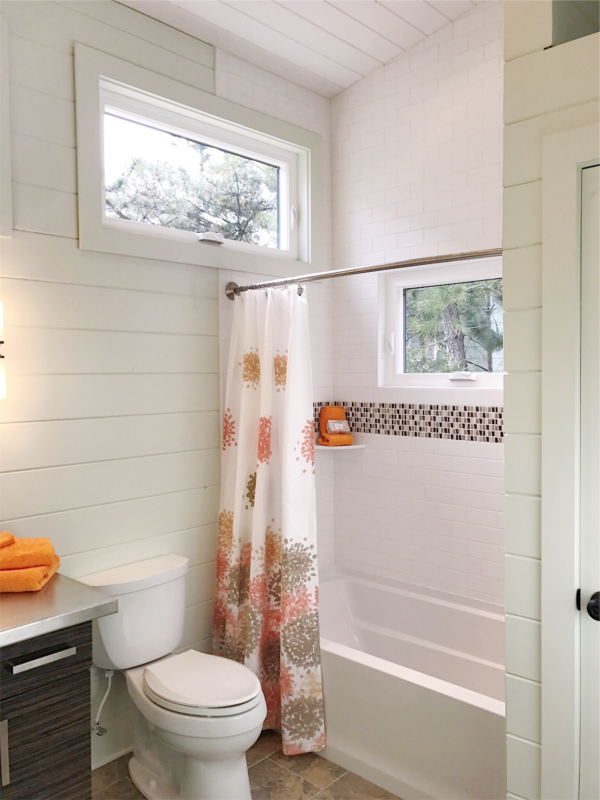 The new master bathroom is now across a private hallway, and the entire suite is very close to the new mudroom/kitchenette, giving this space the feeling of a secluded retreat. My nephew and niece getting mic’d up! 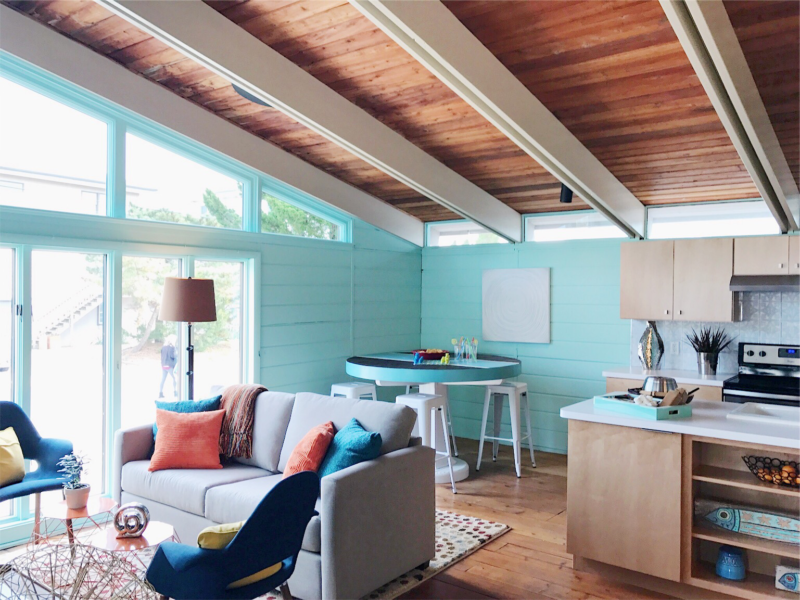 With a little creativity, ingenuity, and planning, my team and I were able to retain this unique midcentury modern beach home’s charm and character, but create an updated, functional coastal retreat for Reg and Rachel’s family to enjoy for years to come. P.S. 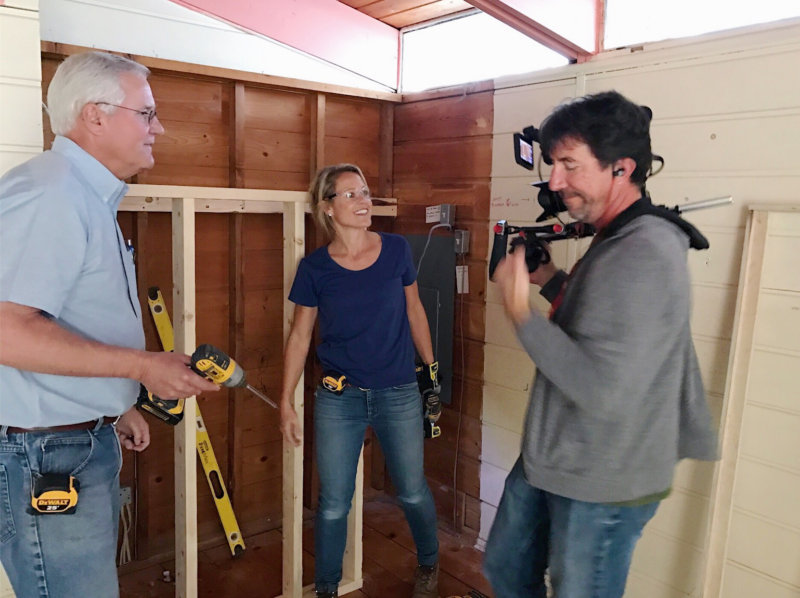 Watch the entire first season of Big Beach Builds online, and then peek behind the scenes with my episode recaps!